So one fine morning in the spring they both set out along the road that led from Kioto to Osaka, one from one end and the other from the other. The journey was more tiring than they expected, for they did not know much about travelling, and half way between the two towns there arose a mountain which had to be climbed. It took them a long time and a great many hops to reach the top, but there they were at last, and what was the surprise of each to see another frog before him! They looked at each other for a moment without speaking, and then fell into conversation, explaining the cause of their meeting so far from their homes. It was delightful to find that they both felt the same wish--to learn a little more of their native country--and as there was no sort of hurry they stretched themselves out in a cool, damp place, and agreed that they would have a good rest before they parted to go their ways. This idea pleased the Osaka frog so much that he at once jumped up and put his front paws on the shoulders of his friend, who had risen also. There they both stood, stretching themselves as high as they could, and holding each other tightly, so that they might not fall down. 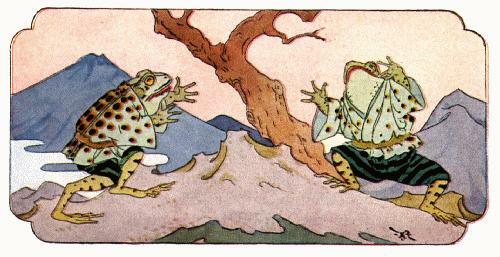 The Kioto frog turned his nose towards Osaka, and the Osaka frog turned his nose towards Kioto; but the foolish things forgot that when they stood up their great eyes lay in the backs of their heads, and that though their noses might point to the places to which they wanted to go their eyes beheld the places from which they had come. 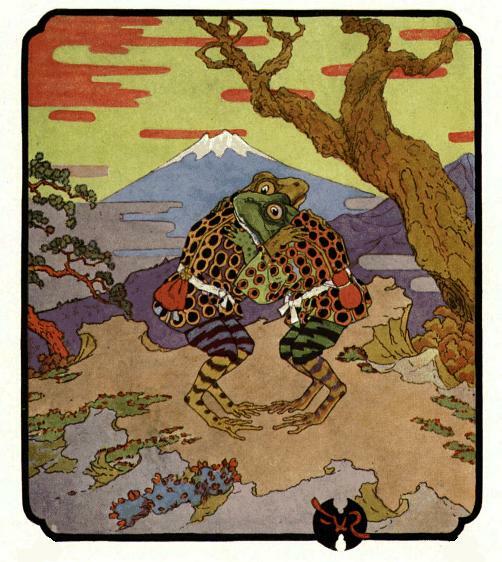 'If I had had any idea that Osaka was only a copy of Kioto I should never have travelled all this way,' exclaimed the frog from Kioto, and as he spoke he took his hands from his friend's shoulders, and they both fell down on the grass. Then they took a polite farewell of each other, and set off for home again, and to the end of their lives they believed that Osaka and Kioto, which are as different to look at as two towns can be, were as like as two peas. This story was extracted from the Project Gutenburg e-text of "The Violet Fairy Book", edited by Andrew Lang. The pictures to go with it were posted on Usenet several years ago, and I don't have any copyright or attribution information for them.